Alamo Lake State Park invites all watercraft users to enjoy the lake, but we ask that you do so responsibly. That means ensuring that your watercraft meets all of the state's regulations for motorized and non-motorized watercrafts. 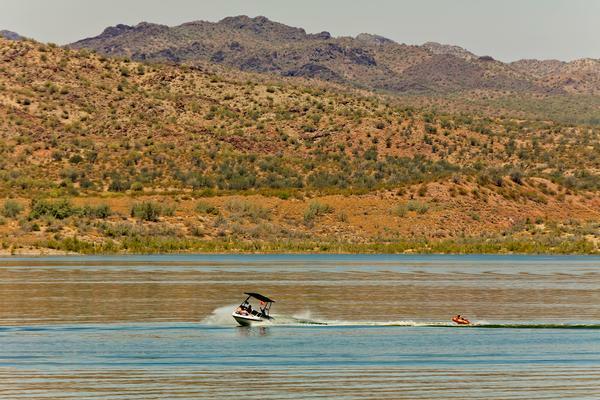 To learn more about the registration, usage, and what type of safety equipment you should bring, visit the Arizona Game and Fish's watercraft information page to make sure you have everything you need before you hit the water. Note: The Main Boat Ramp, Cholla Boat Ramp and the Low Water Ramp are open for use. The main boat ramp is located inside the park. Visitors take the Alamo Rd., take Lakeview Dr. north, and then follow the road until arriving at the main boat ramp. Say hello to our park staff when you pass the Ranger Station. The Cholla Boat Ramp is located in the Cholla Campground on the northeast end of the park. Visitors take Alamo Rd. to get to the park, then take Cholla Rd. north, then follow the road until arriving at the Cholla Boat Ramp. The Cholla Boat Ramp is generally available but may close if water levels are too low. If the water levels are high enough, the park will open the High Water Boat Ramp located just east of the Main Boat Ramp by the boat parking lot. The High Water Boat Ramp will only be made available if the water levels are high enough that launching from the ramp is safe.